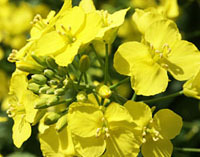 Canola Oil has the highest rates of omega 6 fatty acids and is second only to flaxseed oil for omega 3 fatty acids. The body needs healthy fats to maintain dietary nutrition. Canola oil not only is an excellent source of healthy fats but also contains the least amount of saturated fat compared to sunflower, corn, olive and soybean oils. Omega 3 fatty acids help protect the body from strokes and heart attacks. Omega 6 fatty acids provide optimum brain functioning and encourage healthy infant development. Additionally, canola oil has no transfats that can increase triglycerides levels in the body. With 120 calories per tablespoon, no sugars, salts or chemical additives, canola oil is a healthy cooking and baking alternative to vegetable oils that can increase the body’s cholesterol levels. Canola oil is low in saturated fats compared to corn, soybean, peanut, olive and other vegetable oils. Oils such as safflower, peanut and sesame oils offer some mineral and vitamin benefits. Canola oil, however is devoid of vitamins and minerals. Copyright © 2011-2019. Rapeseed Oil. All Rights Reserved.